This entry was posted on Tuesday, August 2nd, 2011 at 14:00 and is filed under Barack Obama, Politics, Tea Party. In another case of a leftist goon making a sort of psychological confession about his own intentions through name-calling directed at others, the Vice President of the United States has called the Tea Party and staunch conservatives “terrorists.” Accepting the media talking point, those who opposed the Boehner-Reid bill were ‘holding the country hostage.’ It’s ridiculous on its face, but more importantly, it reveals something about the thinking of the establishment inside Washington. Let’s consider the reality with respect to the question of who is terrorizing whom, and who in Washington has the authority, and demonstrated willingness to do so. If ever there had been a terrorist element in the halls and offices of power in Washington, it is not among Tea Party Congressional members where this element may be found, but instead in the entrenched leftist elements that now rule the power structures of Washington with an iron fist. Joe Biden is merely acting as a proxy for the President for whom he works, and is in the actions of this administration that true terrorism may now be found. Terrorism is defined as the use of guerrilla tactics to change the political thinking of a people and their resultant policies. If this is the nature of terrorism, then there is no institution in Washington more familiar with its usage as a matter of ongoing political warfare than Barack Obama and his collection of leftist ideologues. One needn’t go off down some twisting course of conspiracies to find the evidence. In this most recent debate over the Debt Ceiling, Barack Obama appeared on television no less than four times to stress the point that if the impending ‘crisis’ were not averted, there stood a good chance that Social Security checks and military payroll might not go out. If you make a statement like this once, as a matter of factual warning, it is not terrorism, but if you repeat this line, in opposition to facts about what would have been paid in the event of a shutdown, you aren’t informing the public any longer, and are instead levying a threat aimed at a political end, thus committing an act of economic terrorism. Whether organized directly by the White House or carried out by its more loosely associated shills, presidential statements were not the only instances of the left’s desire to terrorize the populace. Throughout the wind-up to the Congressional votes, leftist elements spread across the Internet delivering veiled threats of every conceivable sort, even posting on various forums that the President might have to shut down food inspections for lack of funds, pointing out that within five days or a week, the entire country could be starving. This is another form of terrorism, and while the White House will have been careful not to leave their own fingerprints on any of it, they nevertheless direct their associated groups of willing thugs to spread the terror. Even on an official government page, at the President’s direction, there is displayed a list of answers to questions in the event of a government shutdown, that while factually-based, implies a certain level of uncertainty that definitely will push visitors toward a decidedly slanted view. Taken together with the media’s pro-Obama bias, the crisis-driven fear-mongering of the Obama administration is little else but a form of terrorism. Hoping to drive the electorate to call, write, and fax Congress in the name of its own political ends, this entire operation took on the appearance of a disinformation campaign with fear as its driving force. Consider also that their primary targets are those who would in any other context be considered the most vulnerable: Seniors, the poor receiving assistance, and those who have made the fewest preparations for emergencies. This isn’t accidental, and when you consider the breadth of the effort, it becomes a damning indictment of the conduct of this administration. Presidents are supposed to be our leaders, and a source of stability and resolve in the face of crisis, but apparently not when they are the driving cause of the crisis. Rather than reassuring and acting in the name of all the people to responsibly see to the financial solvency of the nation, our President has made of himself another looming, threatening villain. To then have his side-kick accuse Tea Party Americans of “terrorism” is a cruel and vile defamation, and a distraction from the truth of the matter. Rather than pointing fingers, as they employed the driving drumbeat of fear to fight their political war, they might consider the galling irony of just what sort of terrorists they become. The Tea Party is terrorist? 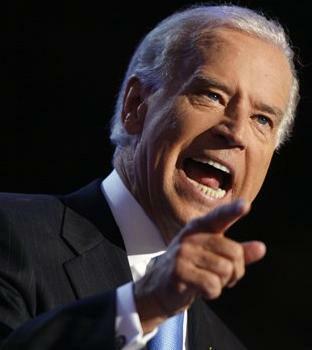 Sorry, Mr. Biden, but your side has that role covered. One Response to So Now We’re Terrorists? The very ones who wont call a terrorist a terrorist , calls us terrorist.. If there is a dem or rhino left standing in Nov. 2012 then we haven't worked hard enough, or their term isn't up yet.